David Gordon, Live Archiveography, 2017. Performance view, Vincent Astor Gallery, New York, March 30, 2017. Photo: Paula Court. 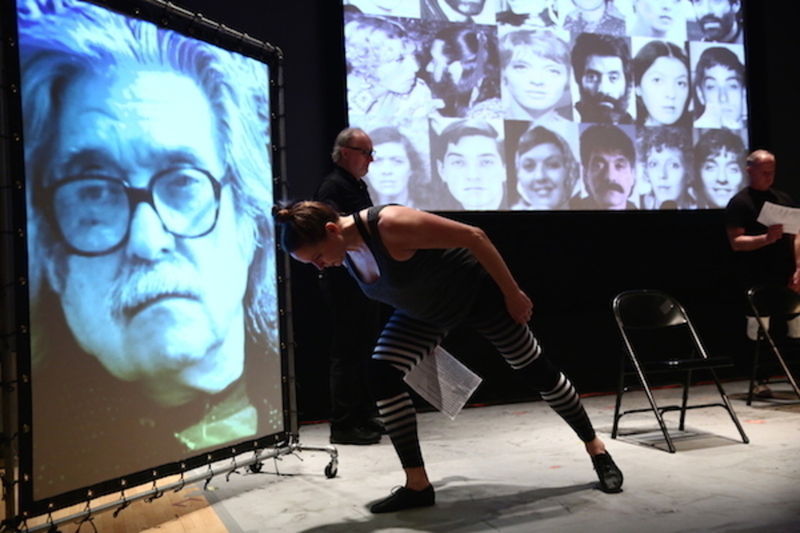 David Gordon—longtime director, choreographer, actor, playwright, and cofounder of the Judson Dance Theater and the improvisational dance company Grand Union—is preparing to present Live Archiveography, 2017, a performative extension of “ARCHIVEOGRAPHY – Under Construction,” his massive retrospective that was recently presented at the Vincent Astor Gallery at the New York Public Library, as he discusses here. Live Archiveography runs from June 1 to June 3, 2017, at the Kitchen in New York as a part of the LUMBERYARD in the City Festival. WHEN I WENT TO TALK WITH THE PEOPLE AT THE NYPL about them having my archive, they asked me if I would, at some point, want to do a public Q&A for it. I said no thank you. They asked why, and I said that I’d been to some of those events and that they weren’t very interesting. I said that if I were going to do something like that, I would want to, in some way, make it matter as a live performative situation, versus rehashing some events from a pile of press clippings. Well, the NYPL said they were interested, so I began trying to invent some way that an archival circumstance could be performative while, yes, answering some questions. And what we ended up doing was very well received, so we did two different versions of it. And then ODC/Dance in San Francisco wanted a version of it, and then the opportunity to develop it through the LUMBERYARD presented itself. So Live Archiveography is a collage happening in real time of things from different eras of my creative history. I’m making old new work. Or new old work. Everything I did as an artist—or whatever you want to call me—surprised me as I was going through my archive. For the first three or so years of my career, I kept nothing . . . at all. It didn’t occur to me that it was important to do. It seemed foolish to keep bad reviews and it seemed immodest to keep great reviews. I just threw everything away. One afternoon at the Judson many years ago, Simone Forti was there, talking to somebody in the bleachers. And when the man she was chatting with left, she pulled a pad out of her pocket and began writing. I asked her what she was doing and she said, “I’m writing down what I just said. Someday, somebody’s going to want to know.” And I considered that and thought, Well, maybe I shouldn’t throw everything away. So I bought a used file cabinet and just started putting things into the drawers, with no rhyme or reason for what went where. I only started organizing it during the last three or four years, when people started talking to me about my archive. David Gordon, Panel, 1986, video, color, sound, 4 minutes 25 seconds. It’s interesting—I thought I had spent my life working to make each new concert very different from the last. But as I began to look at everything I did, I saw that I was making one concert, with many different parts, for fifty years. As I was going through the archive, I’d see a piece of material, or the subject of a piece of material, and then it would show up five or ten years later. I’d find something and think, “Wait a minute—that’s that, again!” It’s something I can’t get away from. I discovered early in my career that I was not an abstract artist. I’m a storyteller. I make things happen that are about something. It could be a clear narrative, it could be a disrupted narrative. But narrative supports everything I do. I never thought about all this until I began to go through my archive. There was continuity, even though I had tried very hard to avoid continuity. My archive also makes clear that I was working in the world among other artists. And all the television and movies I watched, the literature and headlines I read—those things, too, affected the kind of art I wanted to make. I don’t make things in some private “inspirational” world. My work is a reaction to the world. I’m always paying attention. Everything’s connected. That sort of continuity has to do with my relationships, my family. My mother had four sisters—they all raised me. Their men were all working or in the army, so I was around a lot of women. And they referred to themselves with some frequency as my “other mothers.” And my grandmother, their mother, was never farther away than next door. And if you mouthed off to one of them, another one of them would say, “Don’t talk to her like that!” That was my life. There is something about those women and my grandmother and the stories that my grandmother told—I think it’s how I learned to hear stories. Somebody always had a story about something, frequently terrifying. My life is full of many different families. My son was born two days before my first performance at the Judson! I remember being at the hospital, visiting my wife, the dancer Valda Setterfield, and our new baby. One evening I get up and say, “I’m sorry, I have to go because it’s the first night of the Judson.” And I take a taxi down to the Judson and walk in and say, “Okay, when do I go on?” And they say, “Now.” So I take off my shoes and walk on stage and do the first of the Judson solos. But I had just come from the hospital and held my tiny son in my arms and kissed Valda goodbye—all of that feels so inextricably linked. The Dunn Workshop, which spawned the Judson Dance Theater, which turned into the Yvonne Rainer Company, which then turned into the Grand Union—all are my family. And then there are all the presenters who brought my work to parts of the United States I had never been to before, who worked with me for years—they are my family too. And because of them, I have more families in Minneapolis through the Guthrie Theater and the Walker Art Center. So everywhere I go, everyone I work closely with, I develop a new family. But one of the things about getting to this age, and it’s really peculiar, is seeing an awful lot of your family die. Trisha Brown, who got me into the home I’ve had for many decades now, is gone. My family is disappearing, but I’m still sitting here, watching them go.